“When I looked closely I realized that there wasn’t much in place for the Hispanic community. It motivated me to do something special. 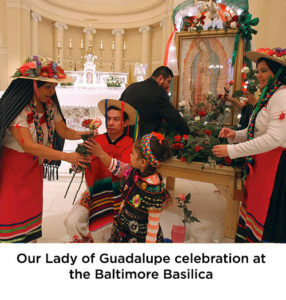 That’s how this all started,” said Dr. Ivan Garcia, who established The Our Lady of Guadalupe Endowment Fund to foster pastoral work and evangelization among Spanish-speaking Catholics in the Archdiocese. This is why Dr. Garcia has made such a strong commitment to the Spanish-speaking community within the Archdiocese. He finds its members to be a major force in the future of the Catholic Church. He is especially devoted to seeing their spiritual needs are met. “Ultimately, when your time comes to meet our Creator, it is the spiritual that will get you through. During times of difficulty, your spiritual values bring you comfort. When you’re doing what you can to help the soul and spiritual well-being of an individual, you really have done everything you can for a person,” Dr. Garcia Concluded.